The annual election of officers for 2019 will take place at the monthly meeting on October 9th, 2018. Members are encouraged to attend and vote. As a reminder, this is a good opportunity to pay your membership dues for 2019 in person. Any club rules infractions witnessed by a club officer, director, certified chief range safety officer, or certified range safety officer shall be dealt with in a timely manner. If a regular club member witnesses a rules infraction, they may notify an officer, director, or RSO of the particular details of the event with supporting evidence. The officers, directors, or RSO will then investigate and determine if sanctions are necessary or warranted. Sanctions for club rules infractions shall include, but are not limited to, verbal warnings, assessment of fines, temporary loss of membership, permanent loss of membership, or criminal/civil charges being filed at the local magistrate. Any rules infraction or activity that is determined to be an immediate danger to life or property will result in immediate removal from club property and a temporary loss of membership until a meeting of officers, directors, and RSO’s can be convened to decide a permanent sanction for such behavior. The member that has been accused of a serious rules infraction has the right and opportunity to address the meeting to plead their case prior to a permanent resolution. With the exception of verbal warnings, immediate removal from club property, and temporary loss of membership as enumerated in Article X Section 1, Line 4; all other sanctions shall be voted on by the duly elected or appointed club officers and directors. An agreement to a sanction will occur if a majority vote of the club officers and directors is in the affirmative. The Club President shall convene a committee to review current club range rules. The committee shall convene, at a minimum, every 5 years, and is open to all membership. Membership suggestions will debated by the committee and examined to see if it is feasible to implement within the constraints of the club property, and design of the ranges. The rules committee shall be directed by a certified and appointed Chief Range Safety Officer. The overall goal of the rules committee is to ensure that current club range rules are in compliance with a safe and efficient club. Current or proposed changes to the club range rules shall be approved by the club officers, directors, and range safety officers. Once approved any range rule changes shall go in to effect after they are announced at a monthly membership meeting and prominently posted in the clubhouse. Section 1 – The Constitution or the “Rules and By-Laws” may be amended by a two thirds (2/3) majority vote of Members present at the monthly meeting. Amendment(s) must be submitted in writing. Section 2 – The amendment must be submitted and posted at two (2) meeting before being voted upon at the third meeting and adopted as mentioned in Section 1. The Constitution or By-Laws may be amended by a two thirds (2/3) majority vote of members present at the monthly meeting. Amendment(s) must be submitted in writing. The amendment must be submitted and posted at one (1) meeting before being voted upon at the second meeting and adopted as mentioned in section 1. Mark your calendars! The annual Public Sight-in and Running Deer dates are set for the two Sundays before Thanksgiving. This year 2017 the dates are November 12 and November 19 from 8am to sunset. Don’t miss it! This event is open to the public and non-members are welcome on these dates only. Any type of hunting rifle may be sighted-in and if needed, assistance will be available. Sight-in will be held rain or shine. Stop by the clubhouse to warm up and get some refreshments as well as conversing with fellow members and friends. There’s always a good story to be heard! Weather permitting we will again hold the annual “running of the deer”. Try your skills on our moving deer target. You’ll get three trips across the range for a modest fee, proceeds to go to the club for range upkeep. Again this year we are continuing a 5- shot string maximum for each run for safety reasons as well as reducing wear and tear on the equipment. Also for these reasons we ask that no slug guns or calibers larger than 30 cal. be fired at the deer target. And just in case you were wondering, the pistol and shotgun ranges will also be available for use those days, too. So come on out and make a day of it! We’re sorry but the outdoor .22 range will be closed because the operators for the running deer are behind that range in the woods and they might not appreciate the gunfire coming at them from both sides of the little area they are hiding in. The Membership Secretary will also be available those days from 11am to 4pm so you can pay your York Rifle Range 2017 dues and get you membership card. Payment may be made by cash or check. If you are not an NRA member, now would be a great time to join at a discounted rate; if you are an NRA member, you can renew thru the club also at a discounted rate. Checks or Credit Cards are preferred for NRA membership. Make checks payable to the NRA. Starting 9/12/16, there will be two air rifle sessions on Mondays evenings. 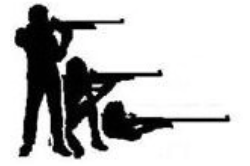 The first session will begin at 6:30pm and will be geared towards the beginner shooters. The second session will begin at 7:30pm and will be geared towards the advanced shooters. If you have any questions, please visit the calendar here. The York Riflemen has decided to sell some of the clubs rifles. All proceeds are going to support the club’s junior program by purchasing new Anschutz 1903 target rifles & other equipment. At this time, only current members of York Riflemen are eligible to purchase the rifles on a first come, first serve basis. We had an excellent turnout for the club’s first 2015 M1 Garand and 500 Agg NRA matches. Congrats to Match Winner, Frank Wasco, shooting an impressive score of 279-8x. Click here for the John C Garand Match results. Official results will be posted on the CMP website here. For the 500 Agg NRA match, Frank Wasco was the match winner with a 491-21x with a 200-16x in slow-prone! Click here for the 500 Agg results. Please join us at out next 80 shot NRA match on Sunday, May 24.